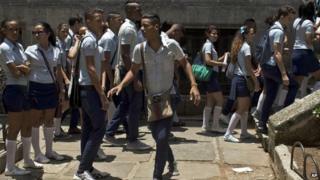 Eight people have been arrested in Cuba in connection with the illicit sale of university entrance exams. As a result, thousands of secondary school pupils in Havana have been forced to resit their tests. Among those arrested are five teachers, an employee at the Ministry of Education and a methodologist. Education is universal and free in Cuba, but salaries are low. Correspondents say it is not that unusual for teachers to sell grades. The authorities said all those accused confessed. It is not clear what charges they will face. "It has been confirmed... that the leaked materials were unscrupulously commercialised by the five teachers, some of whom sold the exams while others reviewed the content with the students," the authorities said in a statement published in the official newspaper Granma. Correspondents say that there have been rumours about the fraud since the students sat their exams early last month. The maths, language and history sections of the exams were reportedly on sale for about $60 (£35).